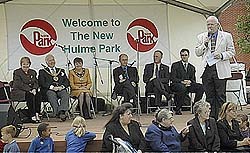 GREETINGS FROM HULME PARK which was officially opened at a ceremony I went along to yesterday. The celebration took place on Zion Square, overlooked by the Zion Centre (above). 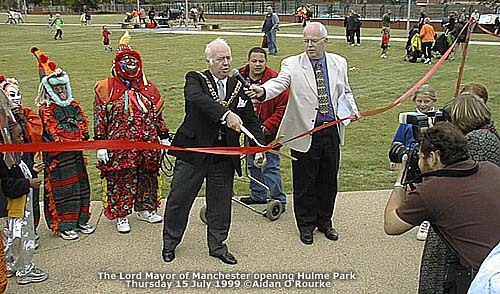 After music and other entertainments, local poet Mikey Sivori read one of his poems - included in the "History of Hulme" artwork (below) - and there were short speeches by Councillor Richard Leese and the Lord Mayor, who cut the ribbon to open the park. 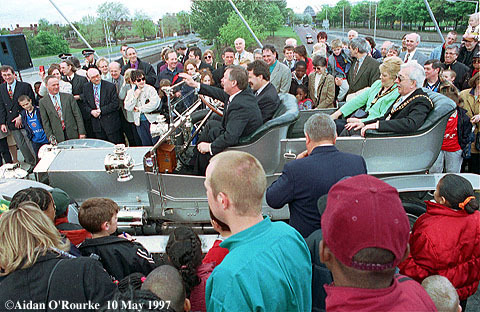 The crowd was a typical inner-city Manchester rainbow mixture of blacks, whites, kids, pensioners, people on benefits, officials in suits and, laughing and joking and mingling with the crowd, the Mayor and Mayoress in their ceremonial chains. 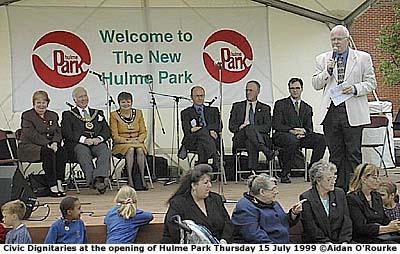 Hulme Park is laid out on the site of the notorious Crescent flats, built in the late 1960's and finally demolished a few years ago. The park is laid out in a high-tech 90's style, with brushed steel posts and fences, curved pathways and benches. The contemporary-style play area is named in memory of two local boys Leroy and Jamie. Safety features include rubber-cushioned ground covering, though I noticed some sharp metal edges, and the climbing rope seems very high to me. 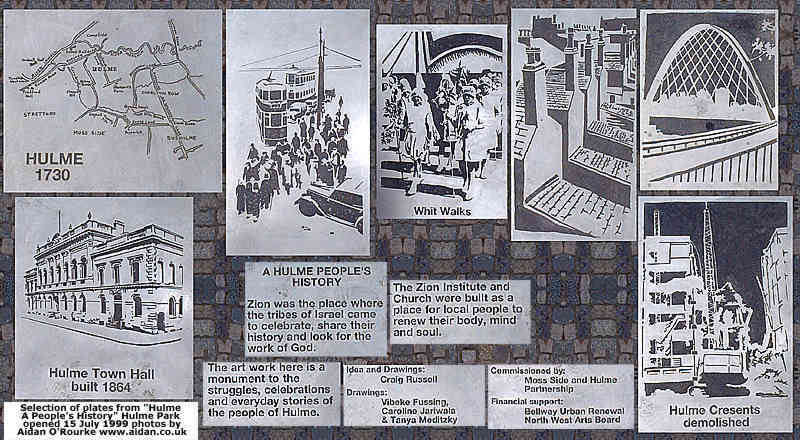 One of my favourite attractions is the "History of Hulme" told in pictures (selection above) engraved on stainless steel plates fixed onto the pavement in Zion Square. Elsewhere in the park, you'll find a skateboard space, sensory garden and sports areas. A bridge is to be built to link the park into the city centre (below right), and extra-terrestrial visitors may find the park a suitable landing point, as it's said to be built on two intersecting ley lines! If you fancy one of those houses (above left), they cost around £80,000 and these are all sold. I had a look round the "Chelsea" show house - nice fittings and layout but I found the rooms rather small. Bellways are building more on the other side of the park, but you'll have to hurry, there are only three left. Who would have thought that homes like this would be selling for these prices on the site of the infamous Crescents? The Crescents were conceived in the 1960's and were once hailed as a showpiece of urban redevelopment. The two grey concrete semi-circular blocks were said to be inspired by the Georgian terraces in Bath - But the comparison proved to be totally inappropriate. Four years after being built, they had degenerated into modern-day slums, plagued by leaking roofs, cracks in the walls and many other problems. The Crescents, along with other deck-access flats in Hulme, are counted among the most notorious of the many failures of 1960's planning. 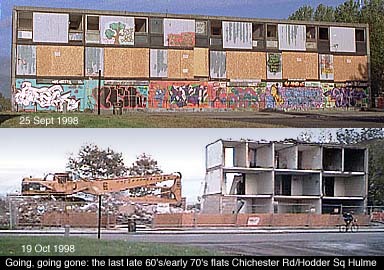 They were finally torn down in the 1990's. 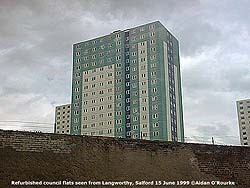 Here is the last one in 1998 just before demolition. 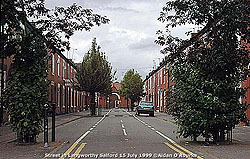 This notoriety was one of the factors which gave impetus to the magnificent redevelopment of Hulme we see today. 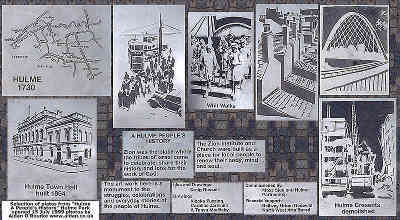 If you have any photos of the Crescents, or memories of pre-1960's Hulme, please contact. 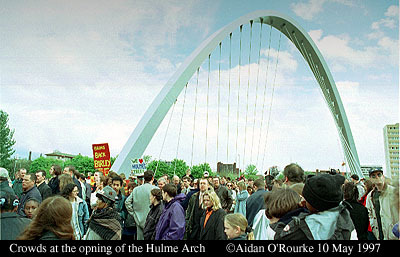 The regeneration of Hulme has been managed by the Moss Side and Hulme partnership, part of Manchester City Council. SIR ALEX FERGUSON has, as expected, been given the Freedom of the city of Manchester. The Manchester United manager accepted the honour at a lunch in the Portland Hotel. Sir Matt Busby is the only other football manager to be made Freeman of the city, an honour which dates from medieval times and is only given to very special people. 20 PER CENT of people in the north west don't, or can't have a bank account. They are excluded from modern financial services because of poverty and unemployment. Many turn to so-called "loan sharks" or unscrupulous money lenders, to obtain loans, but are charged very high interest, and may face criminal threats if they are unable to keep up with repayments. Earlier this week, the MEN exposed a loan company with an office in Openshaw, which operates a £1 a minute phone line. Poor people phone to enquire about loans, but are kept waiting for a long time. An undercover MEN reporter was kept hanging on for 28 minutes before being refused the loan. But inner city communities are fighting back: They are forming their own credit unions so that local people can obtain finance at a fair rate of interest. I find it amazing that in 1999, one fifth of the local population use cash only. And there was excellent news for inner-city communities today with the announcement of millions of pounds of funding economically depressed areas including Langworthy, Salford, and east Manchester's Higher Openshaw, Bradford and Beswick. On Monday morning I was taking photos at the opening of the impressive new Five Oaks Health Centre, just near Grey Mare Lane Market. The previous health centre was destroyed by arsonists in 1994. The new centre is a triumph of regeneration and building design. See my photos in What's New, on the Manchester Health Authority website. MANCHESTER HAS COME third in a UK top 100 league table of retail centres, compiled by Verdict. London came top and Birmingham was second. The Trafford Centre trailed in 24th place. Criteria included numbers of stores, floorspace, transport links and parking. Councillor Pat Karney, of Manchester City Council, was very pleased at the result and predicts, now as before, that by 2009, the Trafford Centre will be demolished. I quite like to go to the Trafford Centre from time to time, as some of the shops are very good, but it can never beat Manchester city centre. TOLLS MAY BE INTRODUCED on the M62. It might cost up to six pounds per day to use the trans-pennine motorway, which runs from Liverpool via Manchester to Leeds and on to Hull on the east coast. This suggestion has come from a group of government and EU-funded transport consultants who have been investigating solutions to the problem of increasing traffic congestion. There has been considerable opposition to the idea amongst motorists and road haulage companies. But in France, Switzerland, Spain and the US they have toll roads and seem to manage OK, so why not here? pic of M62 motorway from near Irlam. 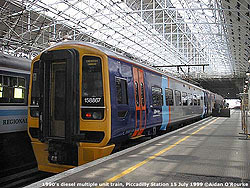 NEWER QUIETER TRAINS will be entering service on routes from Manchester and Manchester Airport later this year. Rail operator First NorthWest has ordered 27 of the new "Coradia 1000" trains, which can travel up to 100mph. 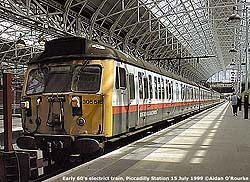 Some routes around Manchester are still operating electric trains built in the early 60's. I remember travelling on them from Stockport to Manchester as a child, it's amazing to think they're still in service. And today it's announced that the police have introduced railway helicopter patrols costing £3500 a day to combat vandalism on railways. Pic of old electric train. COMPO, alias Bill Owen, star of the comedy series "Last of the Summer Wine", has died aged 85. 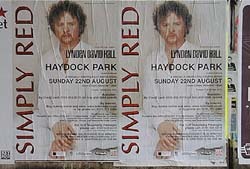 The programme is one of Britain's best-loved comedy dramas, and is filmed in the Yorkshire town of Holmfirth, about 30 miles east of Manchester. REM are playing at the MEN Arena tomorrow night. 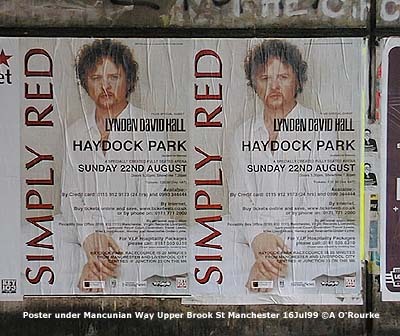 Simply Red will be giving a special performance at Haydock Park in August - here's a poster I snapped under the Mancunian Way this morning. Actually I get more of a buzz from watching unsigned bands performing in small venues Caesar Lounge, who I saw at In The City last September, are playing at the Waters Edge festival Castlefield next weekend. As ever there are hundreds of things going on - if only there was the time to go to them all. MARIA AITKEN, sister of the jailed Tory minister Jonathan Aitken, has criticised the Manchester accent: "It's the content of those whining Mancunian voices you dislike when you hear them on the beach, not the whining Mancunian voices themselves" - This is what she's reported to have said in an interview, but who knows, maybe the comment is taken out of context. If she's referring to the voices of certain Manchester pop-stars, where every sentence contains a swear word, I'd tend to agree with her, but not all Mancunians talk like that. People whose close family members have just been sent to prison for fraud would be well advised not to criticise their fellow countryfolk. MONDAY WAS HOT and sunny, but Tuesday was cloudy, though hot. Wednesday started off cloudy, but there were sunny spells in the afternoon. Thursday was mostly overcast - not so good for the opening of Hulme park, but I returned today and took some extra photos in the hazy sunshine. It's a warm and overcast Friday evening as I write. Next update from Crumpsall in the next few days. Here's a picture from earlier this month taken during fine weather.